Engagingly happy and gracious, our friends in Belize are resilient, family-oriented and grateful for the service we provide. Many of the people we serve have lived in the same village all their lives, never venturing far from their home or families. Villagers often have limited access to medical and dental care, vital medicines and treatments. 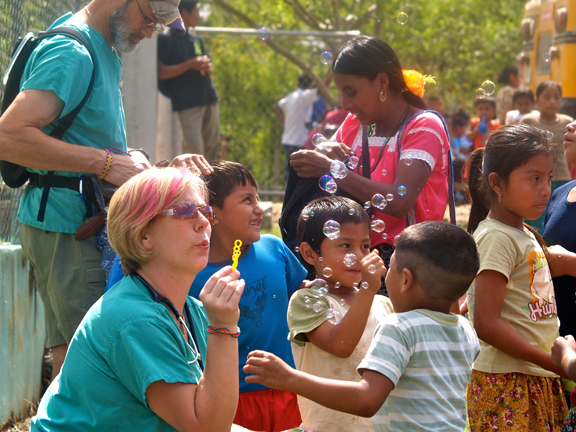 It’s common for locals to live for months with the pain of a toothache, fracture or illness while waiting for relief to come, often in the form of mission teams such as Dos Amigos. For dental patients, we provide extractions, fillings, cleanings, toothbrushes and education on oral hygiene. For medical patients, we provide physicals, critical care and focused treatment when specialists are part of the team. We also provide reading glasses, sunglasses and shoes to anyone who needs them. These are collected all year long by team members or occassionally donated by a non-profit organization. These are always very gratefully received by both our organization and the Belizean people who receive them.